Win over $1000 this year! Over 1000 Things to See and Do on the GO! Win tickets to Big Valley Jamboree, Vegreville Country Fair and much more! Share with us...by giving us a Review on Facebook, sharing your photos, or sharing a story or experience with us online. 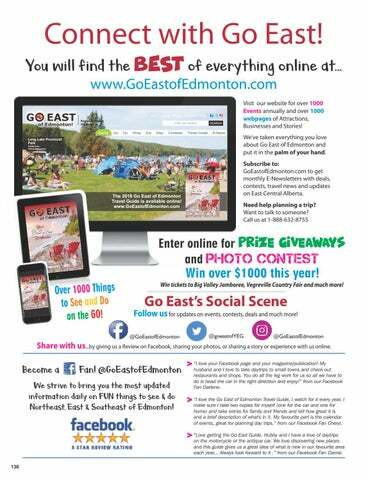 We strive to bring you the most updated information daily on FUN things to see & do Northeast, East & Southeast of Edmonton! husband and I love to take daytrips to small towns and check out restaurants and shops. You do all the leg work for us so all we have to do is head the car in the right direction and enjoy!” from our Facebook Fan Darlene. 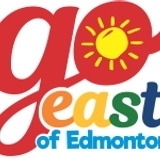 > “I love the Go East of Edmonton Travel Guide, I watch for it every year, I make sure I take two copies for myself (one for the car and one for home) and take extras for family and friends and tell how great it is and a brief description of what's in it. My favourite part is the calendar of events, great for planning day trips.” from our Facebook Fan Cheryl. on the motorcycle or the antique car. We love discovering new places and this guide gives us a great idea of what is new in our favourite area each year... Always look forward to it .” from our Facebook Fan Ciarrai.